Greece can be explored at any pace and any budget. Take a week or even two to experience everything this region of the Mediterranean has to offer, from ancient historical sites to its many islands. Customized arrangements can be made for fully independent itineraries or you can share your experience with like-minded individuals in small group tours. Athens. Enjoy a day or two in Greece’s capital city visiting the ancient sites of the Acropolis and the Temple of Zeus. Go on an urban hike or take the cable car to the top of Mt. Lycabetus for amazing panoramic views of the city. Be sure to visit the historical Plaka district, stopping to have a traditional souvlaki at one of the many local dining establishments. You will not regret it! ​Santorini. The remarkably beautiful, white washed towns of Fira and Oia, sitting atop the caldera clifftops of Santorini, are a photographer’s paradise. Sit by your panoramic pool or on one of the island’s white or black volcanic pebble beaches; no matter where you are the views are outstanding. Indulge in the food and wine and become quick friends with the earnest residents. A visit would not be complete without a catamaran cruise where you can sail around the island admiring the most unbelievable sunset you could possibly imagine. Mykonos. A livelier island with great nightlife and some of the best beaches in the Cyclades islands, aptly named Paradise and Super Paradise. Enjoy the freshest seafood at a local taverna and spend your days admiring the unique architecture. 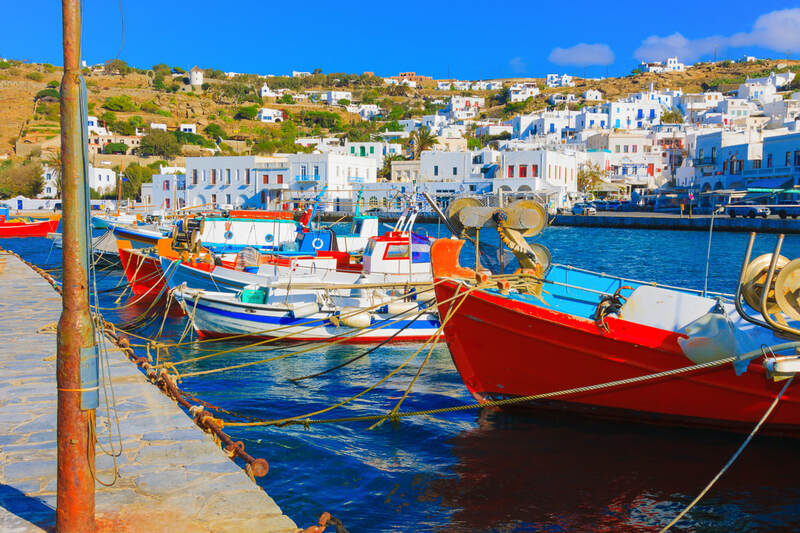 Island hop to Naxos or the unoccupied isle of Delos or just sit and people watch, keeping an eye out for movie and music stars that frequent the island year round.